The Canadian motto “from sea to sea” sums up this country very well. Second only to Russia in land mass, Canada stretches over an enormous territory from the Pacific Ocean in the west to the Atlantic in the east. With nearly 10 million square kilometres, this huge, multicultural nation has a remarkably small population, with only 34 million inhabitants. Canada is a democratic constitutional monarchy, so the head of state is the British monarch, and the government is led by a Canadian Prime Minister. Canada is governed at the federal level by an elected parliament, based on the British model, and federal, provincial and territorial governments share the responsibilities of administering different state mandates. 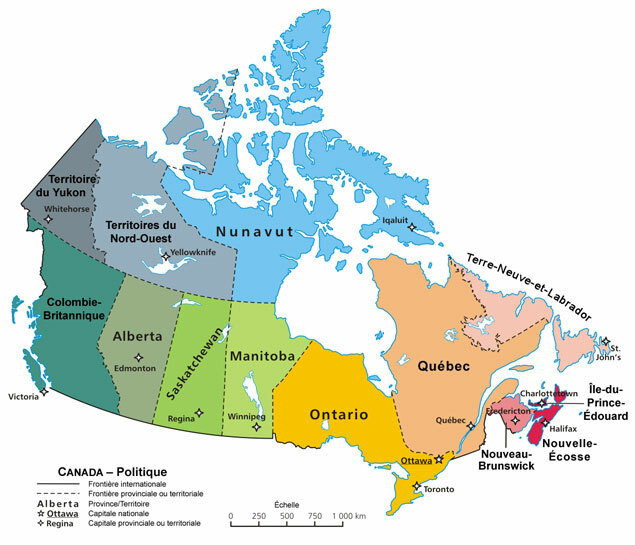 The country is made up of 10 provinces: Alberta, British Columbia, Manitoba, New Brunswick, Newfoundland & Labrador, Nova Scotia, Ontario, Prince Edward Island, Saskatchewan and Quebec. Further, Canada’s north is divided into 3 territories: the Northwest Territories, Nunavut and the Yukon. Canada’s capital is Ottawa, situated in the province of Ontario, and its major urban centers are: Toronto – Montréal – Calgary & Vancouver. Canada is an industrialized country with advanced technology, and its economy is primarily founded on its rich supply of raw materials and resources. The United States is its principal trading partner. English and French are the 2 official languages of the country. New Brunswick is the only Canadian province with full bilingual status. Quebec is officially a French-speaking province, while the rest of Canadian provinces function in English. One of Canada’s most recognizable symbols is the maple leaf. Officially adopted in 1965, the Canadian flag features a red maple leaf at its centre. Another endearing and enduring symbol is most certainly the beaver, the largest of rodent species, integral in trade and exploration throughout the early history of Canada. The beaver was declared Canada’s official emblem in 1975.